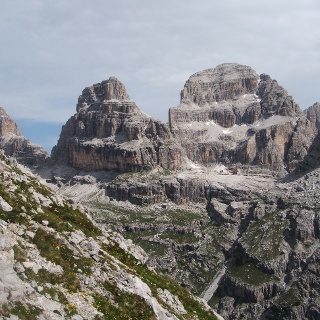 The itinerary between Rifugio Cacciatore and Rifugio Agostini, in the upper Val D'Ambiez, can be covered by means of a very suggestive circular route, at the foot of the Brenta Dolomites, offering unrivalled views over to the incredible pinnacles of Cima Ambiez, Cima Tosa, Cima Brenta, Cime di Ceda, Cima D'Agola, Cima Pratofiorito and Cime di Dalum e Ghez. 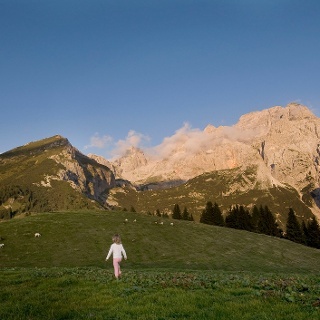 An incomparable opportunity to discover this breathtaking corner of the Dolomites. 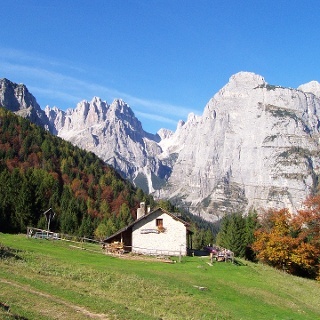 Rifugio Al Cacciatore can be reached from San Lorenzo in Banale by a comfortable “jeep shuttle” service up the rather long Val Ambiez. The jeep ride on the narrow mule track is itself an adventure. Trekking shoes are a must; useful: telescopic walking sticks. Start at Rifugio al Cacciatore ( 1820 m ), ignoring the mule track that continues uphill, and take trail No. 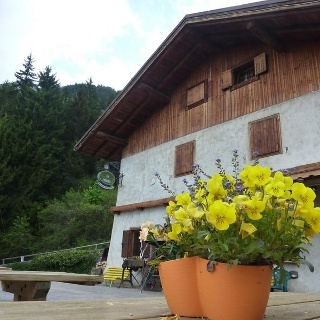 325 A Dallago which skirts the mountain hut. Follow the trail up to the foot of the majestic rocky spur of the “Tose”, the superlative limestone wall, about 300 m tall, which closes to the west the upper Val Ambiez. Continue north with a constant incline (still along trail No. 325) passing beneath the east wall of Cima Pratofiorito. This brings you to Rifugio Agostini ( 2410 m ) surrounded by Cima D'Agola, Cima Ambiez and Cima Tosa. Looking down to the south you can just about see Val Ambiez, the Giudicarie valleys and Lake Garda. After a well-deserved rest you make your way back to the departure point. The quickest route is to follow trail No. 325b (signposted), which more or less coincides with the mule track linking “Rifugio Agostini” and “Rifugio Al Cacciatore”. However, a short detour will take you – along trail No. 320 Palmieri - up to the “Forcolotta di Noghera”, an awe-inspiring observation point on the ridge of the Molveno hollow. From the col trace your steps back along trail No. 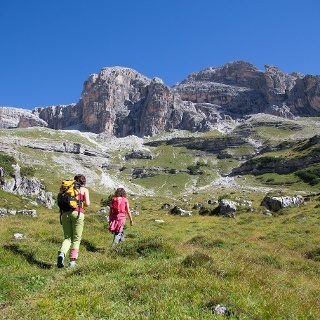 320 (in the direction of Rifugio Agostini), for about 400 m , and then take the clearly beaten track that descends towards Val Ambiez and rejoins trail No. 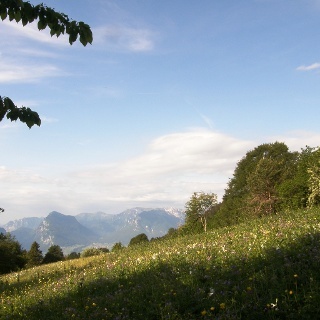 325 just above Malga Prato di Sopra, from where it is a short walk to Rifugio Al Cacciatore. Drive to San Lorenzo in Banale on the SS421 national road, from either the Giudicarie valleys or the Altipiano della Paganella. Just above the church of San Lorenzo take the road to Val d’Ambiez. Follow the directions, through several suggestive hamlets, and continue to the car park at the entrance to Val d’Ambiez (Loc. Baesa), from where you can take the Jeep Taxi service to Rifugio al Cacciatore (info at www.taxijeepbosetti.com or www.taximargonari.com).